Another of my reads for the Classics Club, Our Spoons Came from Woolworths is narrated by Sophia, a young woman who is looking back on her unhappy marriage to a rather feckless artist by the name of Charles Fairclough. In writing this book, the British-born author Barbara Comyns has drawn heavily on her own life experience – it is, by all accounts, a lightly fictionalised version of her first marriage, a relationship characterised by tensions over money worries and various infidelities on her husband’s part. Although it took me a couple of chapters to fall into line with Sophia’s unassuming conversational style, I really warmed to her character, particularly as the true horror of her story became apparent. This is a wonderful book, by turns humorous, sad, shocking and heartwarming. When young Sophia meets fellow artist, Charles, on a train, she soon falls for him against the backdrop of a glorious English summer. In spite of opposition from virtually everyone in Charles’s family, the couple marry very quickly and find a flat in North London which they furnish with secondhand pieces, all painted a beautiful duck-egg green. Their lifestyle is rather bohemian to say the least. Right from the start, money is in very short supply. While Sophia has a regular job at a commercial studio, Charles considers himself to be a more ‘serious’ artist, reliant on the occasional commission or ad-hoc sale for income. In reality, he contributes next to nothing to the household finances – and when he does, it is quickly frittered away on luxuries such as paint, new brushes and restaurant dinners. For all her charms and initial optimism about married life, Sophia is rather naïve, and the first half of the novel is peppered with humorous moments as she tries to get to grips with marriage and running the house as well as being the main breadwinner in the family. Impractical advice from various members of Charles’s interfering family does little to help matters, especially when it’s delivered in a rather condescending fashion – here’s a typical example. Things take a distinct turn for the worse when Sophia finally discovers she is expecting a baby (cue some amusing scenes as she wonders why she has been feeling poorly all the time). Charles is pretty horrified by the prospect of becoming a father, and Sophia herself has no real understanding of the practicalities of motherhood. In short, they are both completely unprepared for what lies ahead. Nevertheless, I couldn’t help but feel for Sophia when I read the following passage. When Sophia informs her boss that she is pregnant, he responds by telling her she might as well leave at the next holiday. We are in the early 1930s here, many years before the introduction of maternity pay and employment protection for expectant mothers. With Sophia out of a job and Charles swanning about all day nurturing his artistic tendencies, the couple’s prospects are very poor indeed. Much to Charles’s dismay, Sophia has a little boy which they name Sandro. He is a fragile little thing, very quiet and gentle and almost certainly malnourished. In spite of all this, Charles doesn’t warm to the child. Not for the first time, Comyns pulled me up short with one of Sophia’s revelations about life with her husband with all his blatant insensitivity. Hooray for Sophia! I think I would have sideswiped him with that chair, too. This is an excellent novel, one that I enjoyed a lot more than I had expected to. For some reason, I had got it into my head that Comyns would be too left-field or eclectic for my tastes. How wrong could I be! I found Sophia a rather endearing narrator – yes, she is gullible and naïve, but she is also sympathetic and good-natured at heart. I couldn’t help but warm to her matter-of-fact, childlike narrative, a style that makes her revelations all the more shocking and impactful when they come, like little bolts out of the blue. One of the things I like most about this novel is the way Comyns weaves various points of social commentary into Sophia’s story, all grounded in personal experience no doubt. There are some truly shocking and degrading scenes depicting Sophia’s treatment in the maternity wards following her admission to give birth. Several of the nurses are cruel and insensitive to her condition, and she is forced to carry her own suitcase from one room to another during a seemingly endless sequence of transfers through the hospital. The lack of proper care doesn’t end there either; this next passage highlights the lack of support and information available to young mothers following the birth. I’ve probably made this novel sound terribly grim, but it isn’t at all. There are quite a few laugh-out-loud moments here, especially in the first half of the book. More importantly, perhaps, we know from the opening page that there is some light at the end of the tunnel for Sophia. By the end of the novel, she is in a happier place having learnt some important lessons along the way. I guess that’s as much as any of us can hope for in life. 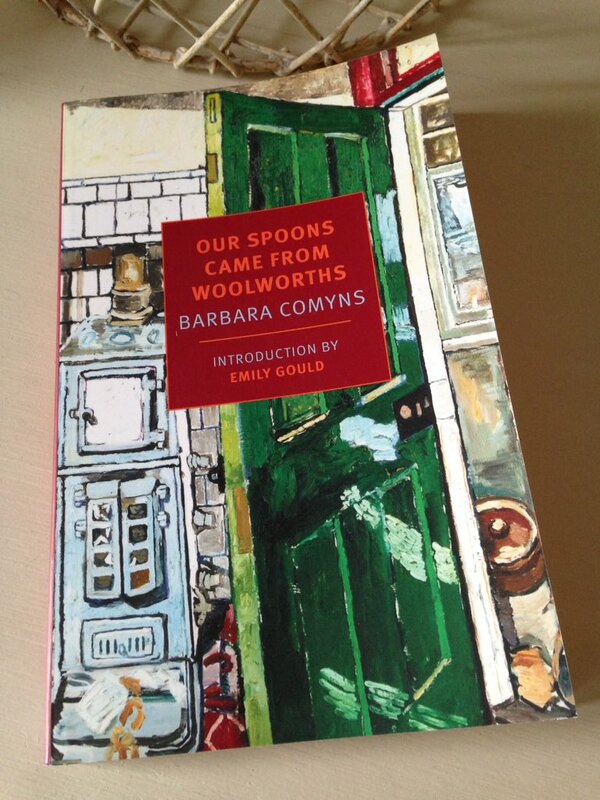 Our Spoons Came from Woolworths is published by NYRB Classics; personal copy. This entry was posted in Book Reviews, Comyns Barbara and tagged #ReadWomen, Barbara Comyns, Book Review, Classics Club, Fiction, NYRB Classics on May 9, 2017 by JacquiWine. Yes, idiosyncratic is a great way of putting it. I really warmed to this – much to my surprise as I didn’t get very far at all with The Vet’s Daughter when I tried it last year! It just seemed too off-beat or left-field for my tastes. Maybe I need to try it again at some point. Yes, I think Vet’s Daughter is not the best place to start. It still has that bizarre blend of gothic monstrosity (she clearly had a terrible set of parents, if their fictional counterparts are accurate) and whimsical naivety: this can become a bit repetitive after two novels in similar mode. But I still think she’s engaging and entertaining, if, as you say, left-field. Apparently her patchy education as a child is responsible for that ingenuous narrative voice and approach, the childlike idioms and vocabulary. I’m not so sure: she seems to know exactly what she’s doing. I have had this on my TBR for a good few years but kept putting it off I think because I had an idea it was grim reading… while it certainly seems to have its moments your review has reassured me there is a good balance and I am now intrigued, both by the narrator’s perspective and the social commentary. May be a while before I get to it as all books still in boxes but I’ll be looking out for it when I eventually unpack. I have to admit to going into this book with a less-than-positive mindset, but as I said in my review, I was very pleasantly surprised! Sophia’s story does have its sad and shocking moments, but the humour balances these at least to a certain extent. Plus, we know from the start that Sophia gets through it all in the end, so that makes a difference too. I think you will really enjoy this one, Poppy – don’t leave it too long to dig it out! I read this fairly recently and loved it too :-) It’s the only Comyns I’ve read, but I think she is a bit more left-field in her other novels. I definitely want to read more fro her. I remember thinking this novel was the most compelling argument for the vital need for a welfare state! Yes, I think you’re right in saying that her others are more ‘out there’ than Spoons, certainly judging on my brief dalliance with The Vet’s Daughter last year (I didn’t get very far with it the end). Good point about this being one of the most compelling arguments for a welfare state! The hospital scenes are truly shocking, aren’t they? Like being in trapped in some terrible Kafkaesque nightmare…what a horror. It is ironic that bad relationships can make for some very good fiction. Charles sounds like frustrating character. Unfortunately he sounds like a realistic character. I can see how a story like this can be both grim and funny. Thanks, Brian. It’s the blend of tones that makes this work so well. Thanks for this. I read this eight or nine years ago so it has jogged some literary memories ! Agree about the grim tale being lightened with humour. If only births were controlled by wishing!!! If I still had my copy I would reread but given the length of my TBR it’s probably a good thing it went off to Oxfam. Great review as always. Wonderful title isn’t it? I read Simon’s review of this with interest also. I wonder if knowing from the outset that things do later improve is necessary to avoid it being too grim? Without that knowledge it sounds like some of the later sections might be hard to manage, credible and convincing as they are (or because they’re credible and convincing). I loved going to Woolworths as a child, especially the pick ‘n’ mix section…those were the days, eh? I think you’re right about needing to know from the start that Sophia is going to get through this, otherwise it would be really hard to take. Much of what she has to put up with from Charles, his relatives and the broader society of the day is pretty shocking. It’s a great book, definitely worth considering – I think you’d get a lot out of it. This is the only Barbara Comyns I have read so far. I enjoyed the unusual quirky voice. I do have two or three others tbr which I must get around to. I think I need to be in the right frame of mind for writers who are a bit left field – but I did enjoy Our Spoons came from Woolworths. Yes, I know exactly what you mean about needing to be in the right frame of mind for something like this as the style is a little unusual. I think that’s why it took me a few chapters to fall in line with Sophia’s voice, but luckily I really warmed to her innocence and naivete. Yes, it must have been pretty dire back then. It made me wonder how much had changed by the time my mother was Sophia’s age – a little, I suspect, but nowhere near enough. Unfortunately in some societies it still hasn’t changed….. The only Comyns I’ve read is The Vet’s Daughter, which I enjoyed. ‘Spoons’ was going to be my next one by her; I saw a copy in my local library the other day and now with your review I think I’m being nudged towards reading it. That’s great. There’s a pretty good chance you’ll enjoy this one especially given the fact that you’re already attuned to the author’s rather unusual style, that tendency to blindside the reader when they’re least expecting it. I need to try again with The Vet’s Daughter, but your fondness for it certainly gives me some encouragement! I’ve had this for years and have almost picked it up several times. It’s definitely worth making time for this one, Guy. I’ll be interested to see how you get on with Comyns. (Have you read any of her others by any chance?) The only element I wasn’t entirely convinced by here was the ending, which I found a little contrived. Without wishing to give too much away, I suspect you might have sone quibbles with it too. A minor point in the scheme of things as the rest of the book was excellent and very convincing. Ah, it’s funny how certain titles can draw us in. I must admit that the title captured my interest too, possibly on account of a fondness for Woolworths that harks back to my childhood years. It’s definitely worth a re-read if the mood takes you. I really fell for Sophia’s rather matter-of-fact way of putting things, more so than I had expected to before I got going with the book. I have her Who Was Changed and Who Was Dead on my shelf, which was an impulse purchase because of the title. I am not sure why I haven’t actually read it yet. I found your excerpts quite funny (especially the part about the chair), so I think I could deal with the grim aspect with no problem. What a compelling title! I’d never even heard of it before you mentioned it, but I shall have to look it up. The balance between light and dark works really well here. It’s a tricky thing to pull off effectively, but Comyns manages it brilliantly. Excellent review Jacqui. The only Comyns I’ve read is Who Was Changed and Who Was Dead which I thought was wonderful. I want to read this, but I’m so afraid I’ll find it sad and it will make me angry with Charles and the rest of the world!! I’ve heard a lot of good things about this novel and you describe it a lot like the other reviewers did. I would have picked it up earlier but I’m a bit scared. Apparently in another novel there’s a lot of cruletly against animals and, according to one reviewer, there are some instances in this one too. It’s something that drags me down too much, so if it’s true, I’ll have to stay away. Although, it’s too bad, as it does sound good. I totally understand where you’re coming from on this, as it would give me pause too. Unless I managed to miss it completely, I don’t recall any scenes of animal cruelty in Spoons. It’s almost certainly there in The Vet’s Daughter — which I started last year but abandoned fairly quickly as I wasn’t in the right mood for it at the time — but not this one. At least, I don’t remember anything of that nature…I’m usually fairly sensitive to that type of thing. I’m glad to hear it, so I might have mixed them up. Maybe she just meant that it was quite sad as well. Maybe. Nevertheless, I can understand if you don’t like the idea of reading anything by this author given the nature of some of her other work. It’s a sensitive subject. This keeps cropping up on my radar – it really does look good. I think this will be one of the first books I seek out after my book ban ends! Good plan – it does seem to be a favourite among bookish types! Even though I’d already had a false start with Comyns, I was very pleasantly surprised by this book. I wasn’t expecting to like it nearly as much as I did. A really shocking quote about her feeling she had brought “some awful animal” home. All the more so said in that self-effacing voice. This is a book on my TBR. I have not got myself a copy yet. But I think it is worth the read. I found it amusing that we have not progressed much from the 1930s. A friend’s friend recently got fired from a job because of getting pregnant. It is really sad that even though we have all the necessary rules to protect women at work places, some institutions find loopholes to get their way without getting questioned. I’m really sorry to hear about your friend’s friend. As you say, it’s a terrible state of affairs in today’s day and age, especially when there is legislation in place to protect the rights of employees in this position. I hope she finds a way through it all. As for the book, it’s definitely worth reading. I can totally see why it has become a popular choice for the Classics Club. This is one I may well read one day. Have you found reading a number of your classics from the same era has enhanced the experience? I think you’d like it, Grant. There’s no Barbara Pym cuddliness here, far from it! Yes, I think all this reading of novels from the 1930s, ’40s and ’50s has enhanced the experience by giving me a better understanding of what it was like for women like Sophia and some of her contemporaries. In some ways, life seemed a lot simpler back then, less hectic and pressurised. But then again, in other respects it was much harder as evidenced by many of the scenes in this novel. I’ve never heard of this writer, so thanks for the introduction. You’re welcome. I think I discovered her when I was looking around for suitable titles to add to my list for the Classics Club. Her name kept coming up again and again, especially across the blogosphere and Twitter. This book in particular seems to be a favourite. As for Charles, I think he had it coming! What a wonderful piece of social history this sounds and I already feel for Sophia – the birth control quote made me smile and wince all at once! !